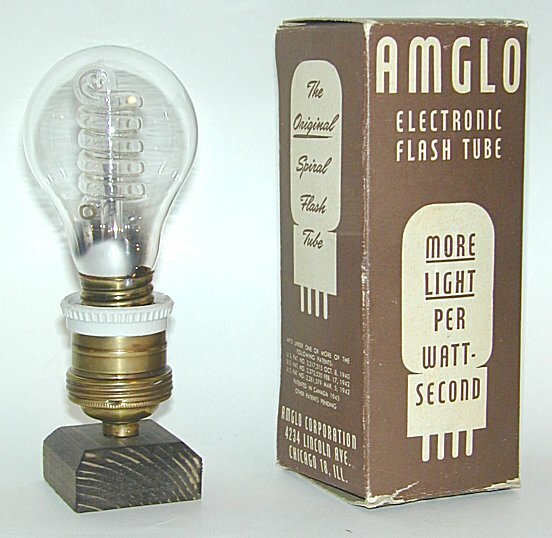 The name Amglo may not be a familiar one to figural glow light collectors, however some very unique bulbs have surfaced that should be of considerable interest to collectors. 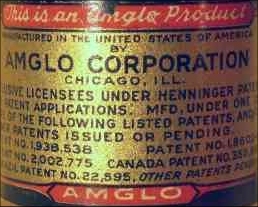 The Chicago based Amglo was formed in 1935 by Andrew F. Henninger, Jr. Based on bits and pieces of information it appears that Amglo first started out manufacturing specialty or custom gaseous discharge lamps including neon indicator tubes. In recent years some examples of bulbs have become known that are clearly based on Henninger's unique decorative glow light patents. The catalyst for this article is the glow display pictured below which advertised Sheaffer's pens, pencils, and skrip. I have known for some time that similar neon advertising displays existed. An opportunity arose a few years ago to purchase the Sheaffer's display. I was attracted to the complex design of the display and the mystery of who made it. Unfortunately there was nothing to determine who made the display. There are no markings on the bulb nor the electrical control box that it was tethered to. Not having any other leads I decided to spend some time on the USPTO website. 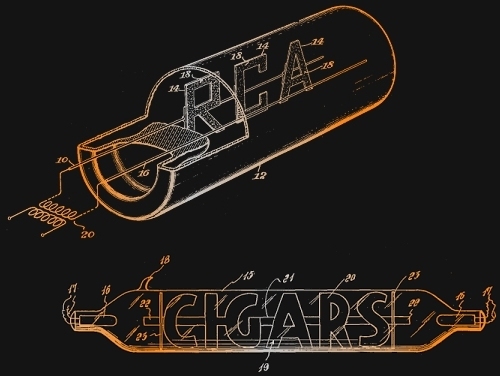 After several nights on the USPTO database I started to come across some intriguing neon lamp patents including those illustrated below from the 1930s. The illustrations in the patents were similar in appearance to the Sheaffer's display. After studying the newly found patents, I decided the designs were different enough to say for certain that the Sheaffer's display did not match any of those described in the patents. I gave up searching for more information until I had a solid lead to follow. A couple of years later I found the lead I was looking for completely by accident. I had just purchased an Amglo open spiral flash lamp (ca.1950). The tube was still unused and in its original packaging. The packaging listed several patent numbers. Curiosity took me back to the USPTO site where I plugged the numbers into the patent database. The patents were filed by an inventor named Andrew F. Henninger, Jr. This established a link between Amglo and Henninger but I was still no closer in identifying the Sheaffer's display bulb. 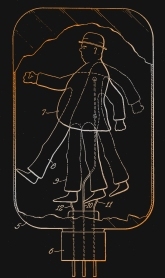 While researching earlier Henninger patents I came across one invention that dealt with an unusual figural glow lamp that gives the illusion of motion. More were found including a patent for a neon bulb containing numbers or letters that could be arranged to form a sign or address. The big break came when I stumbled onto US patent No. 2,020,413 titled MEANS FOR OBTAINING FLAME EFFECTS IN NEGATIVE GLOW DEVICES filed May 18th, 1931 by Andrew F. Henninger, Jr. The design illustrated in this patent clearly matched the complicated construction of the Sheaffer's display. Confirmation came recently when a similar bulb surfaced, having an intact base bearing a large gold "Amglo" label. At last, the unusual Sheaffer's neon display bulb was identified. These lamps are quite complicated in design and the inner details are very intricate. They were probably difficult to produce and given their scarcity today it is doubtful if any such bulbs were mass produced. I found the Sheaffer's display with a small black electrical box attached to it by way of a long cord. The design of the display, as outlined in Henninger's patent, lends itself to special visual effects when the display is in operation. These effects are not normally seen in the design of simpler figural glow lights of the era such as those made by Aerolux. By energizing and de-energizing certain electrodes within the display it is possible to produce and control unique glowing effects. In the patent such effects are referred to as "flaming effects." The black electrical box was the control box for this display. By today's standards, the mechanical circuitry inside the control box is crude but it did allow current to be interrupted. Current is cycled by the use of small heating coils which act as thermostats which open and close a circuit dedicated to one particular electrode in the display. The result caused an eye catching visual display inside the lamp and was probably quite impressive given the technology at the time. The control circuit was an important part of the display's operation and Henninger filed for patent No. 2,072,622 Feb.16th, 1931 titled CIRCUIT FOR NEGATIVE GLOW DEVICES. Shown below are close-up pictures of the Sheaffer's display made by Amglo. Clicking on the pictures will bring up a larger image. Researching Sheaffer's advertising tells us the display dates to the later part of the 1930s based on the script of the lettering. It is still unknown how the lamp was incorporated into Sheaffer's advertising but one theory places the lamp inside a point-of-purchase pen display case. As hinted to earlier, other examples of Amglo neon displays have become known. Below are examples from the collection of Chris Kocsis . The "Music by Gabel" display tube was used in the 1930s Charme jukebox manufactured by the John Gabel Manufacturing Company in Chicago. Both displays share the same characteristics as the Sheaffer's display shown above and the Gabel display tube still has a large Amglo label attached to the base. The pictures shown below come courtesy of Bill Butterfield and illustrate how the Gabel lamp was incorporated into the Charme jukebox. Amglo's family of early neon lamps also included indicator lamps. The lamp shown below is a neon indicator lamp from the same era as the display lamps shown above. The construction of this lamp is very similar as well. Thanks to Peter Stonard for sharing these pictures. One particular application has been discovered for this indicator lamp. 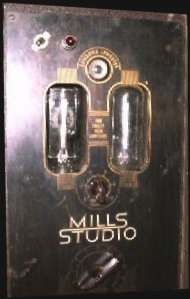 The 1937 Mills Studio jukebox employed these lamps as visual displays for both their base and treble controls. 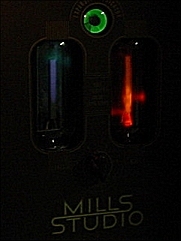 Similar in respect to the "magic eye" or "tuneon" indicators used in vintage radios, the Amglo indicators provided an attractive visual display when making tonal adjustments to the Mills amplifier. 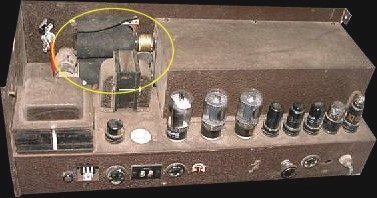 Pictured below is a Mills amplifier for the Studio model juke. Circled are the locations of the two Amglo indicator tubes on the chassis. The next picture shows the front face of the amplifier. The two Amglo indicators can be clearly seen along with a "magic eye" vacuum tube directly centered above them. As shown above, an interesting variety of neon lamps have been produced by Amglo based on Andrew Henninger's early patents. These lamps were probably made in limited quantities. Most appear to have been made for Chicago based companies during the mid 1930s. Browsing through Henninger's patents have revealed many more interesting designs such as the motion lamp shown below. This article is not intended to be the definitive history of Amglo's neon lamps, but rather an introduction based on the limited material I have on the subject. I welcome you to contact me with any additional information about Amglo and Andrew Henninger's early glow lamp patents.